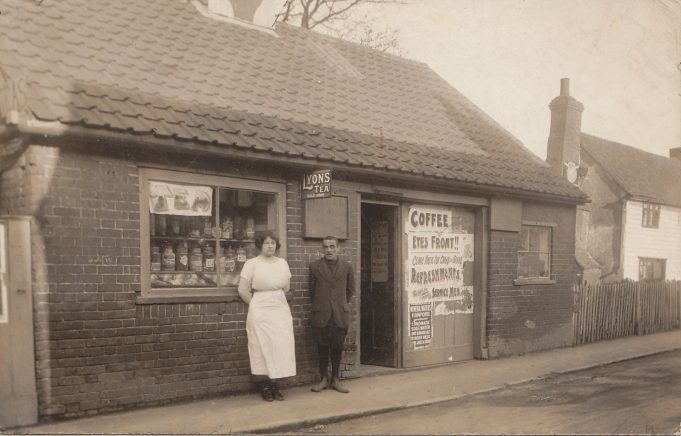 This shop was on the north side of Sun Street towards the back of the estate agents which is now on the corner with the High Street. If you look on the left of the photograph the weatherboarded building is thought to be the Half Moon pub, which was on the site of the former petrol station. Dating the photograph is difficult but there is a reference to ex Servicemen on the advertising. Unfortunately we can’t decipher the words before the reference to ex-servicemen, maybe you can. What we can say is that this photo is between the wars because the building is believed to have had its windows bricked up and used as an ARP station during WWII. Because of the ex-servicemen reference it would indicate that the photograph may be from just after WWI. The view looks to be from the direction of the Catholic church in Laindon Common Road. The “fair ground “field would back onto the rear of the shop and the front of the shop facing the west side of the Sun Pub. I do remember buildings there and later a steam engine in the grounds.